Nathan Scates had already lost his security guard job after being charged for a shooting in Yamhill. 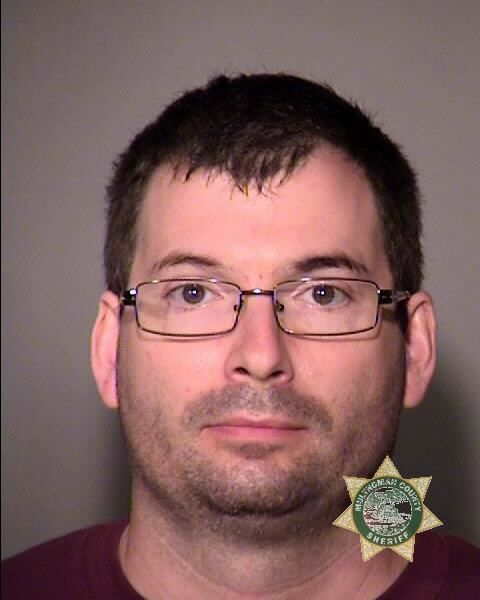 Portland Police say a local security guard will be charged with a hate crime after he allegedly unlawfully used his baton and pepper spray — all while mouthing racial slurs. Lake Oswego resident Nathan Adam Scates, 37, faces charges for second-degree assault, second-degree intimidation and second-degree unlawful use of mace. Police say the security guard confronted a Muslim family on a Willamette River public dock located at 1510 S.W. Harbor Way on Aug. 10, 2018, according to a news release. While in uniform, Scates allegedly used an ASP baton to strike the hand of a woman who was part of the family. "During the course of this event, Scates uttered racial and other slurs," a police spokesperson wrote. After people on the pier dial 9-1-1, Scates began to walk away and allegedly deployed pepper spray on an Hispanic couple who were uninvolved in the original altercation. Scates was recently charged after a lengthy investigation — but he already lost his job after allegedly shooting a woman in McMinnville on Aug. 24 of this year. According to the probable cause document filed in Yamhill County, Scates was walking by the McMenamins Hotel Oregon when he took some food from an outside dining table, which he assumed was left over. Several patrons returned to their table and began yelling at Scates before he could dine and dash. Scates apparently walked away to the intersection of Northeast Third and Ford streets, but the small crowd followed him. "Nathan said that he feared for his safety and drew his 9mm handgun from his pants, pointed it at the ground and told the group of people to stay back," Officer C. Desmond wrote. Scates then fired four to five shots into the ground. One shot hit a woman directly in the leg and another ricocheted off the ground, striking her hand. Officers said the people were standing about 15 to 20 feet away at the time of the shooting. Scates was charged with third-degree assault, second-degree disorderly conduct and three counts each of menacing, reckless endangering and unlawful use of a weapon. The case is ongoing. Scates remains in Multnomah County jail at the time of this report.